Low back pain is a common problem in the United States, affecting as many as 20% of adults. Chronic low back pain can be severe and debilitating. While anyone can have low back pain, it is more common between ages 40 and 60 years. What are the structures of the spine affected by pain? The spine is composed of irregular-shaped bones known as vertebrae. Each vertebra is stacked on top of another and separated by fibrous, cushioning, quarter-sized discs. Ligaments, muscles, and nerves support the vertebrae which form the spine. The neck region is the cervical spine, the middle section is the thoracic spine, and the low back area is the lumbar spine. According to the National Electronic Injury Surveillance System, an estimated 2 million people went to the emergency department for low back pain between 2004 and 2008. They concluded that the incidence rate of low back pain is 1.4 per 1,000 person-years in America, with low back pain causing 3.15% of emergency visits. Each year, 13 million people see a doctor regarding chronic back problems, and 2.4 Americans are disabled due to back pain. What signs and symptoms are associated with low back pain? Injury or strain – From twisting, lifting, and/or bending. Spinal arthritis – An arthritic or rheumatic condition. Herniated disc – Involves the inner gel-like material penetrates the tough outer disc layers. Vertebral compression fracture (VCF) – Caused by osteoporosis or trauma, a vertebra can collapse. Spinal stenosis – Narrowing of the space around the spinal cord. Degenerative disc disease – Loss of water content and aging of the intervertebral discs. Facet joint syndrome – The tiny joints along the posterior aspect of the vertebrae often lose cartilage and produces pain. Who is at risk for low back pain? Certain people are more at risk for low back pain than others. Risk factors include advancing age, being overweight, smoking, being a female, and doing physical work. 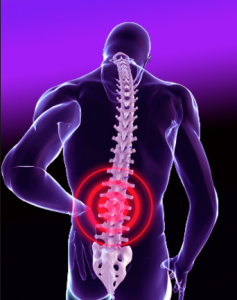 The Gilbert pain management doctor will attempt to uncover the cause of your back pain. He will ask questions about your symptoms, take a detailed medical history, inquire about family history, and conduct a thorough physical examination. Certain diagnostic tests are used to evaluate the spine and back structures. These include x-rays, magnetic resonance imaging (MRI) scans, computed tomography (CT) scans, and bone scans. Physical therapy – Using ice/heat therapy, electrical stimulation, massage, and ultrasound, the therapist can relieve discomfort. In addition, strengthening and stretching exercises are used to improve mobility. Medications – Numerous agents are used for back pain, including anticonvulsants (Tegretol and Neurontin), antidepressants (nortriptyline and amitriptyline), muscle relaxants (Baclofen and Flexeril), and nonsteroidal anti-inflammatory drugs (NSAIDs). Facet joint injections (FJIs) – The tiny facet joints along the posterior region of the spine can be injected with a steroid and anesthetic drug. 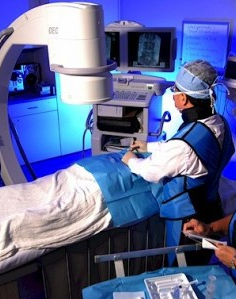 This procedure involves fluoroscopy (x-ray guidance), which allows for correct needle positioning. According to randomized controlled trials, this procedure has an efficacy rate of around 75%, with long-term effects reported in one-third of study participants. Epidural steroid injection (ESI) – Usually given in a series of three, ESI involves injecting a corticosteroid agent, with or without an anesthetic, into the space around the spinal cord. This reduces spinal nerve inflammation and irritation. Platelet-rich plasma (PRP) – The discs and spine structures can be injected with PRP, which contains potent growth factors. PRP promotes a healing effect and stimulates collagen growth. According to clinical studies, PRP has an 80-85% efficacy rate. DeKompressor discectomy – To treat a herniated disc, the doctor can perform a minor procedure that involves inserting a small catheter into the intervertebral disc. Small tools are used to drill away problematic material that has seeped out of the disc. Intradiscal electrothermal therapy (IDET) – To repair tears in the outer layers of the disc, the doctor can perform a minimally invasive procedure called IDET. After a wire and catheter are placed into the disc using x-ray guidance, electrothermal heat is used to thicken collagen, closing tears and cracks. Dr. Ajay Yeddu is the top pain management doctor in the East Valley, serving Gilbert, Chandler, Queen Creek, Mesa, Maricopa and surrounding areas. Most insurance is accepted and Dr. Yeddu is the best back pain doctor in AZ! Call us today. Waterman BR, Belmont PJ, & Schoenfel AJ (2012). Low back pain in the United States: incidence and risk factors for presentation in the emergency setting. The Spine Journal, 12(1), 63-70.